This lesson plan, provided by PBS LearningMedia, focuses on Martin Luther King Jr.’s strategy of nonviolence and challenges students to think about how they would respond to the aggression King faced. Students will analyze primary sources and acknowledge other leaders who have risked their lives in nonviolent protest. Click here to access a printable version of this lesson plan. Institutionalized Racism – Sets of policies and procedures followed by major societal institutions that have the effect of discriminating against people based on race. 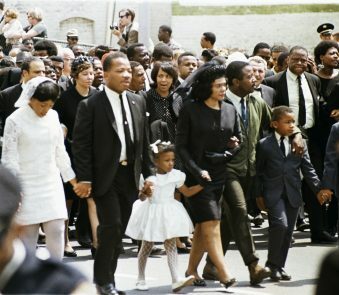 Civil Rights Act of 1964 – Passed in the wake of a series of nonviolent protests by civil rights activists throughout the South and the massive March on Washington, this law banned discrimination in places of public accommodation such as theaters, restaurants, hotels, parks, and playgrounds. It also outlawed discrimination by unions and employers, the latter provision enforced by the establishment of an Equal Employment Opportunities Commission. Supported by President Kennedy, it was signed by President Johnson following Kennedy’s assassination. Voting Rights Act of 1965 – Signed by President Johnson, this law required federal oversight of voting procedures in parts of the country that had previous records of suppressing the voting rights of racial minorities. Following the passage of the Voting Rights Act, voter registration and voter participation by African Americans in the South skyrocketed. Background on Martin Luther King Jr. In Georgia, like many US states in the 1930s, segregation and discrimination on the basis of race were not only commonplace, they were also lawful. For Martin Luther King, Jr., born in 1929, the topic of race was important from an early age. His father was a successful Baptist minister, who passionately fought racial prejudice, believing racism and any type of superiority of one race or class over another to be contrary to God’s will and the teachings of the Christian faith. King grew up in Atlanta, and took the lessons on humility and fairness instilled in him by his parents seriously. He graduated early from high school and went to college at the age of 15. By the time he graduated with a sociology degree, he had deepened his faith and wished to follow in his father’s footsteps. In Seminary School, he was especially influenced by the philosophy of Mahatma Gandhi, the leading voice for self-rule in India. Using a strategy of nonviolent direct action, including civil disobedience, Gandhi had led India to independence from British rule and inspired other struggles for freedom around the world. King saw a direct connection between Gandhi’s philosophy and the teachings of Jesus. Violence, King believed, would only lead to more violence. On fire with this philosophy, King completed his PhD at the age of 25. He had met and married Coretta Scott, and soon became a pastor at a Baptist church in Montgomery, Alabama. A newcomer to Montgomery with a strong professional background, King attracted the notice of the local NAACP chapter when they needed someone to lead a boycott of the city’s buses. The boycott, spurred by the arrest of Rosa Parks after she refused to give up her seat to a white passenger, would need to rally the entire black community of Montgomery to have the necessary impact. The NAACP wanted a success without breaking the law so that they could persevere against segregation in the courts. King led the boycott, and held his ground as boycotters endured violence, and he even suffered the destruction of his own home. Ultimately, an appeal to the justice system prevailed, and Montgomery’s bus segregation laws were declared unconstitutional. This success led to the formation of the Southern Christian Leadership Conference, which gave King, as its head, a nationwide platform to speak on race-related issues, have meetings to help black voters register, and coordinate protests. King used the teachings of Gandhi as he encouraged students to perform “sit-ins” at white-only lunch counters. They endured physical and verbal abuse, but by 1960 had successfully ended lunch counter segregation in 27 cities. Of course, not everyone agreed with King’s tactics. He drew harsh criticism from black activists who demanded immediate equal rights at any cost. Malcolm X was a Muslim minister and leading activist for the Black Nationalist and Black Pride movements. “Turning the other cheek” was not on his agenda, and he let the White-controlled mainstream media and political leadership know it. Malcolm X was not alone. Other intellectuals also questioned King’s approach. A turning point came in 1963. King drew nationwide attention with a large demonstration in Birmingham, Alabama, where police turned dogs and fire hoses on the nonviolent demonstrators. King was jailed and criticized for endangering his constituents, but for many Americans in cities with less racial tension, the images on television shed light on the dark reality of racial inequality in their country. 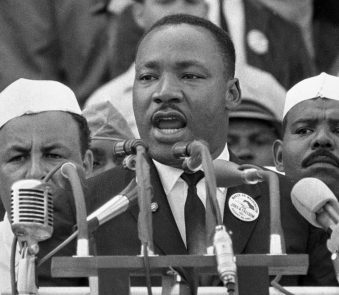 In August 1963, having gained significant traction outside the black community, King led more than 200,000 people in the historic March on Washington, where under the Washington Monument he delivered his famous “I Have a Dream” speech, imagining a world in which skin color would play no role in people’s judgments of one another. 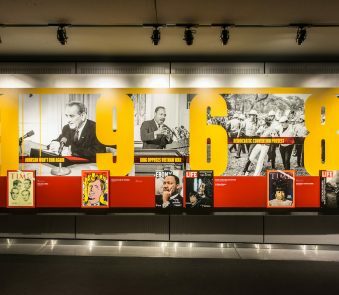 1964 saw the passage of the Civil Rights Act, which made segregation of public accommodations unlawful nationwide, and King was awarded the Nobel Peace Prize for his role. On April 4, 1968, King was assassinated at a motel in Memphis, Tennessee, after delivering a speech in support of a labor strike. His death sparked riots across the country. King’s killer spent his life in prison. Despite his short life, Dr. King is today remembered as one of the most impactful figures in the history of race relations in the United States. Martin Luther King Day is a federal holiday in January, honoring the birthday of Reverend Dr. Martin Luther King Jr. Ask students: Have you ever responded to aggression with calm? Why did you decide to respond in this way? How was the situation resolved? Of course you have heard of Dr. Martin Luther King, Jr., but did you know about his commitment to nonviolence even when he was arrested, threatened, and bullied? Let’s learn more about King and his philosophy of nonviolence. Project or make copies of this photo. This photo of members of the Mississippi Highway Patrol confronting Dr. King and other civil rights activists was taken on June 8, 1966. On June 5, a law student named James Meredith, best known for having been the first black student to attend the University of Mississippi, launched a solo 220 mile march from Memphis, Tennessee, to Jackson, Mississippi. He undertook what he called the “March Against Fear” to encourage African Americans to register to vote. On the second day of the march, however, he was shot three times by a white supremacist sniper and was unable to continue. Dr. King and leaders of other major civil rights organizations vowed to finish the march and asked others to join in. Nearly three weeks later, thousands of people, including James Meredith, held a rally in Jackson, Mississippi–the largest civil rights demonstration ever in the state. What do you think is going on in this photograph? What is the goal of the Mississippi Highway Patrol officers? What is the goal of King and the others standing beside him? At this point in history, Dr. King had won the Nobel Peace Prize and was an internationally known figure. How might this impact the amount of force that the officers were willing to use? 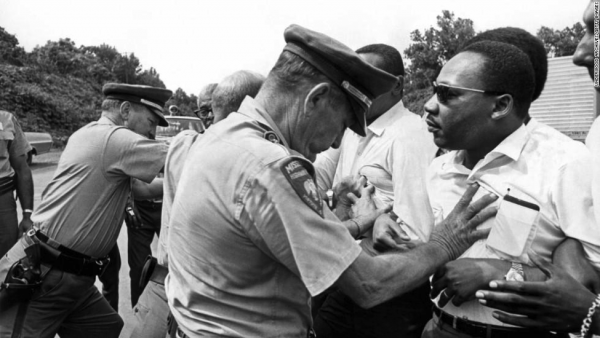 What do you think Dr. King was thinking while being pushed by the officer? How might you react in a similar situation? At the end of the Montgomery Bus Boycott, the Montgomery Improvement Association, headed by Dr. King, issued a series of guidelines for members of the black community as they prepared to board the newly integrated city buses. Students will read and answer questions about this compelling primary source, currently housed by the Alabama Department of Archives and History. Download the Primary Source Activity [PDF]. This can be done as an in-class follow-up to the lesson, as a homework assignment or as a multi-day in-class project. Students have learned that Martin Luther King had both great achievements and significant challenges. He was criticized, threatened, attacked, arrested, and, eventually, assassinated. Have students compare King to other leaders who similarly took great risks to promote social justice.